CARETAG is a purpose-built, easy to use, client-centric service delivery system designed to streamline your administration, saving you time and money. CARETAG was custom designed to address the challenges of service providers in the community care industry, specifically, National Disability Insurance Scheme providers, and Aged Care providers. From our extensive experience providing IT solutions for these industries, we understand that operating budgets are becoming tighter, service expectations are elevating, and reporting requirements are increasing exponentially to comply with government regulation. All of this places a burden on already tight resources, making operational efficiency paramount to survive and thrive. The CARETAG System helps to streamline your operations, making service delivery, record keeping, staff management and reporting efficient and easy. Designed with the client and carer in mind, the CARETAG System removes the need for manual data entry during support delivery, freeing up the carer to concentrate on the client, optimising service delivery time. CARETAG complies with NDIA’s and MyAgedCare’s requirements of client service approval, utilising mobile-dedicated functionality. A simple tap-on/tap-oﬀ action at the start and end of service delivery closes the reporting loop. Reduce manual administration, double entry errors, and improve your organisation’s cashﬂow, with streamlined invoicing and reporting functionality. CARETAG is compliant with NDIA and MyAgedCare systems, has automatic management of allocated funding, and invoicing for services delivered daily. 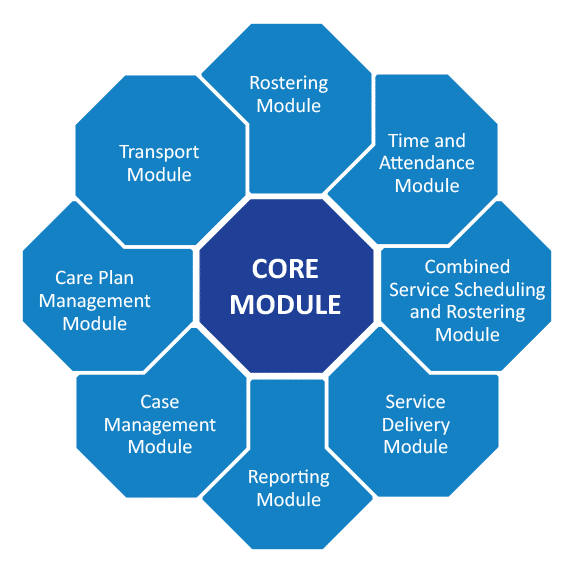 CARETAG’s modular system allows you to select and use only the modules that your organisation needs, resulting in improved efficiency and streamlined operation, thereby reducing operating expenditure. We understand that you may have an existing system that may be inﬂexible and not quite meeting your organisation’s changing requirements, so to maximise functionality while keeping costs down, we have developed a ﬂexible, modular system. CARETAG is the only truly mobile application of its kind, operating regardless of mobile internet connectivity, enabling real-time reporting, reducing paperwork and administration time. Simply start with the Core Module, then choose the additional module/s you require. All modules are self-contained yet intuitive, designed to operate individually or cohesively with each other. Click here to view modules. Intuitive operation for clients and carers of all ages and abilities, easy to use – no training required. Automated data transfer in real time, regardless of internet connectivity. Immediate tap-on/tap-oﬀ client service validation system complete with photographic evidence to satisfy NDIA and MyAgedCare reporting requirements. Android and iPhone compatible, integratable with your own device, or we can supply hardware for you.